The movie sword set. The blade of the sword has been constructed by hand fromcarbon steel and the tsuka has been extended for more power. This sword isperfect for beginning sword collectors who want a serious sword, or materialartists looking for an economic and yet sturdy sword. The steel blade has beenhand crafted of high carbon steel. The carbon has been hammered throughout theblade to gave the blade a consistent hardness. The katana measures 39.5 inchwith a 26 inch blade, the wakizashi measures 31 inch with an 18.5 inch bladeand the tanto is 21.5 inch overall with an 11 inch blade. 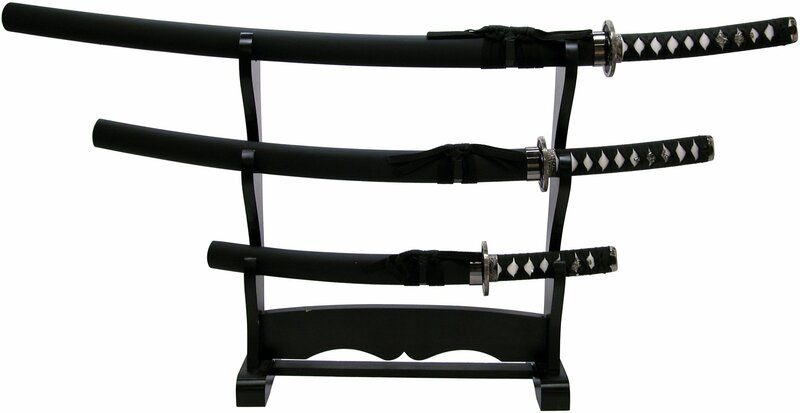 The set comes with asword stand which is ideal for display purposes.